But what happens when you feel forced to make a decision or act in a way that causes you to sacrifice this value? You likely feel uneasy and uncomfortable. For example, saying to your boss, “Well, looks like we’re going to be late on the project we discussed.” It doesn’t matter how or why it happened. The outcome is still an unpleasant experience. When this happens, you likely experience a values conflict. 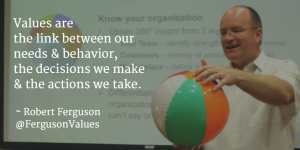 Your decisions and behaviors did not support your top value. 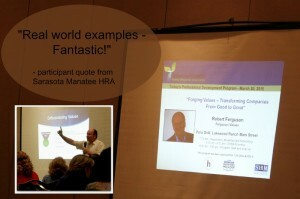 Now imagine that your top values are Excellence and Accountability, in that order. If a quality issue occurred that caused a delay in meeting a promised deadline, there might be no values conflict (or much less of one). When you’re demonstrating support for a top value (i.e. Excellence), it’s feels acceptable to sacrifice a secondary value (i.e. Accountability). This is called a values trade-off and confirms the importance of rank-ordering your top values. 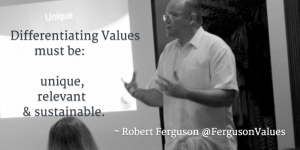 By prioritizing your values, it helps you make better decisions, and minimizes that unpleasant experience when one value must be sacrificed over another. The same is true in organizations. And no matter what the core values are, or their priority order, there will be conflict. 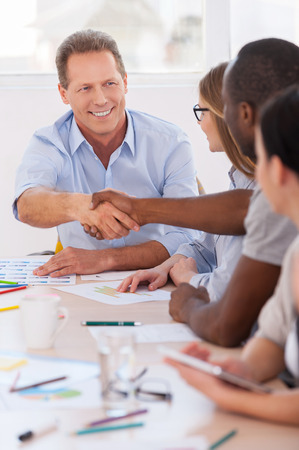 Many organizations promote healthy conflict amongst employees. This is the willingness to disagree – even passionately when necessary – around important issues and decisions that must be made. It’s about the pursuit of truth and the search for the best possible answers. Most organizational behavioral experts and leadership consultants agree that this is healthy conflict, which only happens when there is a high degree of trust between employees. 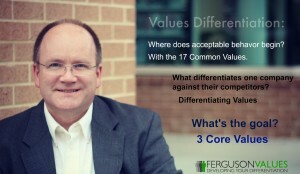 In such cases, it’s very beneficial to have clearly defined core values. 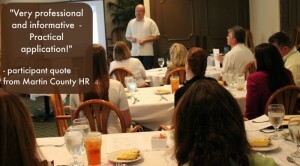 This helps employees work through healthy conflict using the core values as a conflict resolution tool. Unfortunately for many employees, there’s a lot of unhealthy conflict where they work. A telltale sign of unhealthy conflict is when the discussion is people-centric instead of problem-centric. In such cases it tends to get personal and nasty very quickly. The reason for such unhealthy conflict is common, and avoidable: blaming others for our own problems. This form of conflict is the reason most people demonstrate a fear of conflict. In addition, the consequences for unhealthy conflict can be severe, from dis-engaged employees to lack of commitment to reduced productivity. So what can you to about it? Ignore it. Sometimes a conflict is so small, it’s almost irrelevant. Any attempt to address it is like making a mountain out of a molehill. In such cases, the best solution is to just ignore it. For example, a shipment arrives 20 minutes later than you promised, but no one seems concerned or makes any fuss about it. Just ignore it. Address it. Oft times conflicts can be resolved by simply addressing them directly. In an organization, a values conflict might arise if decisions are made or actions taken that result in compromising a stated value. Having a meaningful and respectful discussion with others impacted may be the simplest way to resolve it. For example: sincerely apologizing for missing a promised delivery date, explaining the steps taken to fix the situation, and the plan to prevent it from happening again. Negotiate around it. Sometimes a conflict is more complicated than we initially thought or involves more parties than originally considered. Ideally this is a healthy conflict where you’re just following the process to find the best solution to resolve a gnarly problem, even if the discussion with others is heated at times. What matters most is to stay focused on the problem, not the people involved. For example, the inclusion of a new product feature requested by customers requires sacrificing the long-standing values of simplicity and ease-of-use, that have differentiated the company for years. Should this particular customer request be ignored? 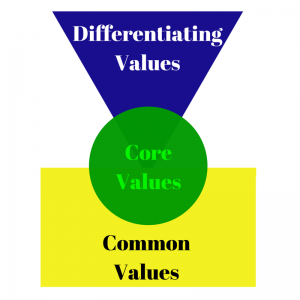 Or is it time for the company to shift the priority of differentiating values? There are no easy answers here. 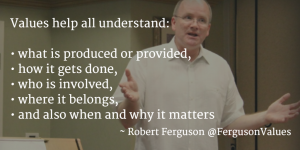 It requires the involvement of all stakeholders. But working together, creative solutions can be uncovered that open up new possibilities. Mediate through it. There are times a conflict turns out to be quite serious and requires more drastic action. Sometimes there are significant financial implications. Other times it may be bruised egos getting in the way (including our own). Resolving such conflict requires a strong mediator: to listen well, ask thoughtful questions, be able to influence others to compromise, and find the best solution that works for everyone. For example, poor quality output, missed deadlines, low morale, and unhappy customers are a clear indication there are bigger issues at stake. Someone external clearly needs to be brought in to identify the real issues and push for real change. There are also two other popular ways to deal with conflict, neither of which is useful or effective. Deny it. The fear of conflict causes many people to avoid dealing with it – ever. Instead they hope if they continue denying it, it will eventually just go away. Unfortunately, this behavior tends to make things worse, allowing it to become a bigger problem than it was originally. Fight it. The other side of fear of conflict is the idea if you attack it you can kill it. But conflict can’t be simply stamped out (that’s called bullying). Even when we think a conflict is dead, issues remain, waiting to be addressed. Bottom line: There are both healthy and unhealthy conflicts. Well-defined core values are a useful tool for employees to work through healthy conflicts. 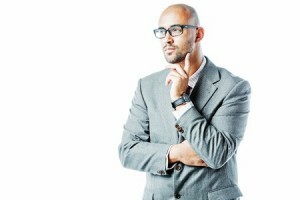 Regardless of the type of conflict, there are effective ways to resolve them. What are other effective ways to resolve conflict?